BLO celebrates the 100th birthday of Leonard Bernstein with eight performances of a double bill of one of his most successful early pieces, the opera Trouble in Tahiti (1952) and his last completed work, the song-cycle Arias & Barcarolles (1988) in the version for two singers and two pianists. Leonard Bernstein often complained that he never had enough time to compose the music he wanted to—he was always too busy—but the list of works he did complete is long, and nearly all of the best of it is vocal music. The range of musical styles he worked in is extraordinarily wide—he knew everything there is to know about the standard repertory and about thousands of other works—but the range of subjects he engaged with is comparatively narrow, and all of the subjects came out of his own life: love, family, and all the various ties that bind. He had a title for Arias & Barcarolles for decades before the work took shape. After a concert at 1960 in the White House in which Bernstein played Gershwin’s Rhapsody in Blue, President Dwight D. Eisenhower, in the unexpected role of music critic, observed, “I like music with a tune in it, not all them arias and barcarolles.” Bernstein’s final work contains neither an aria nor a barcarolle, but it does develop from a lot of music he had composed for other occasions, dating back to 1955—a piece he wrote to celebrate the birth of his son Alexander. There was also music he wrote for his daughter Jamie’s wedding in 1984, and a song he composed to celebrate his mother’s 88th birthday in 1986. But all this music is adapted for a new purpose—an exploration of love, and specifically family love. There are seven songs, a prelude and a postlude, each dedicated to someone important in Bernstein’s life. In the prelude, the only words are “I love you,” which the singers are directed to sing without expression while the accompaniment depicts just how difficult love is, or how difficult the challenges that love faces are. The last of the songs is wordless, although the original text, a bit of doggerel comparing his mother’s 88 years to the 88 keys on the piano, suggests that the elusive answer to every dilemma lies in music. Likewise, the trouble in Bernstein’s first opera was not in Tahiti; instead it was right here, in an affluent, orderly, unnamed suburb. This was not the kind of suburb that Bernstein grew up in; in fact he spent most of his childhood and adolescence in Roxbury, Massachusetts, playing with friends in Franklin Park. Nonetheless, his family was similar to the one depicted in Trouble in Tahiti, and the principal characters Dinah and Sam are in many ways similar to Bernstein’s parents, Sam and Jennie (Dinah was the name of one of his grandmothers). Both of them were immigrants from Ukraine; they grew up 75 miles apart but did not meet each other until they were in America. Their marriage endured for 52 years, and Sam Bernstein died holding his wife’s hand. 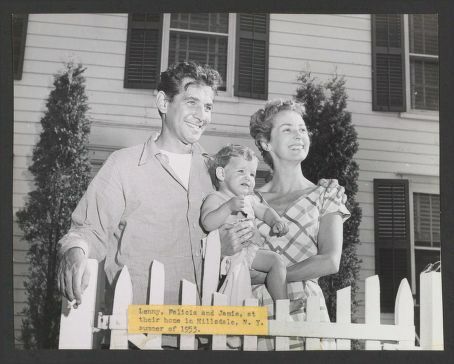 Bernstein was devoted to each of his parents, but his biographers agree that their marriage was a mismatch. An important dimension of Trouble in Tahiti is satirical—a wickedly witty look at the “perfect” American family as depicted for more than two decades on network radio and, in 1952, in the new medium of television. A jazzy, swinging vocal trio joins Sam and Dinah onstage to set the scene and deliver the ironic commentary—Bernstein compared their role to that of a singing commercial on the radio, or the Chorus in an ancient Greek play. Sam and Dinah are both self-absorbed—he in business, the idea of success, and idle flirtations, she in daydreams formulated by Hollywood. Sam wins a game of handball instead of going to Junior’s play; Dinah sneaks out to the movies to see a schlocky escapist film set in the South Pacific called Trouble in Tahiti, complete with Hollywood stereotypes of U.S. military personnel, a heroine in a sarong like Dorothy Lamour, wailing natives, a tidal wave and an erupting volcano (at the time Bernstein was writing this work, Rodgers and Hammerstein’s South Pacific was in the third year of its seven-year run on Broadway). Dinah at least wants something different from what she has, and imagines life as an idealized garden—a potent symbol for Bernstein that turns up in his later works like Candide and West Side Story and indeed his most ambitious opera, A Quiet Place, composed 30 years later. That work opens at the funeral for Dinah, who has died in an automobile accident, and incorporates the whole of Trouble in Tahiti as a flashback. 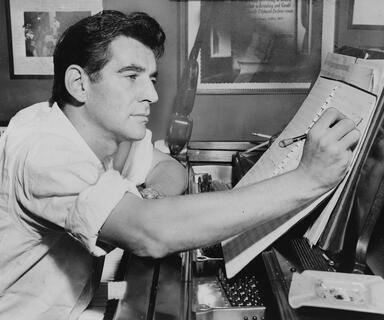 Bernstein wrote the libretto for Trouble in Tahiti in Mexico before his marriage, but then there was a hiatus because of other events and commitments; surprisingly, he began composing the music about a failing marriage while he was on his honeymoon in Mexico with his new wife, the Chilean actress Felicia Montealegre. Finally, during her first pregnancy, he spent five weeks holed up and composing in earnest at the Yaddo Colony in upstate New York. The premiere took place during the first Festival of the Creative Arts which Bernstein curated at Brandeis University. The circumstances were not ideal—the outdoor amphitheater seating 3,000 people was not yet finished; the sound system was terrible; and the schedule of symposia was overcrowded and ran late, so the performance began at 11PM. Bernstein wasn’t happy and revised the final scene before the second performance at Tanglewood, a few weeks later (where it was directed by Boston impresario Sarah Caldwell), and then conducted it on television— it was one of the first new operas to be televised, just short of a year after Menotti’s Amahl and the Night Visitors. Bernstein’s opera was returning to its roots in popular culture—and popular culture is what the opera both celebrates and subverts. 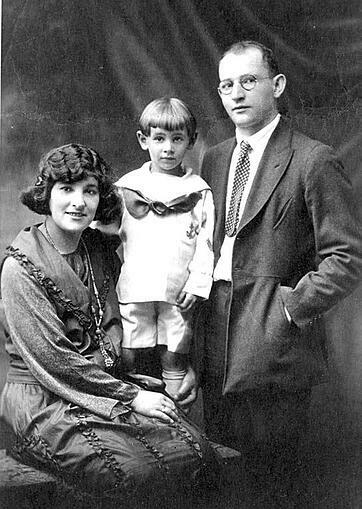 Images: Bernstein making an annotation to a music score, Al Ravenna, World Telegram & Sun and Library of Congress; Family Portrait of Leonard Bernstein with his parents, 1921, Library of Congress (Music Division); Leonard and Felicia Bernstein with their daughter Jamie in 1953, Library of Congress (Music Division). This was republished from CODA Spring 2018 Magazine.